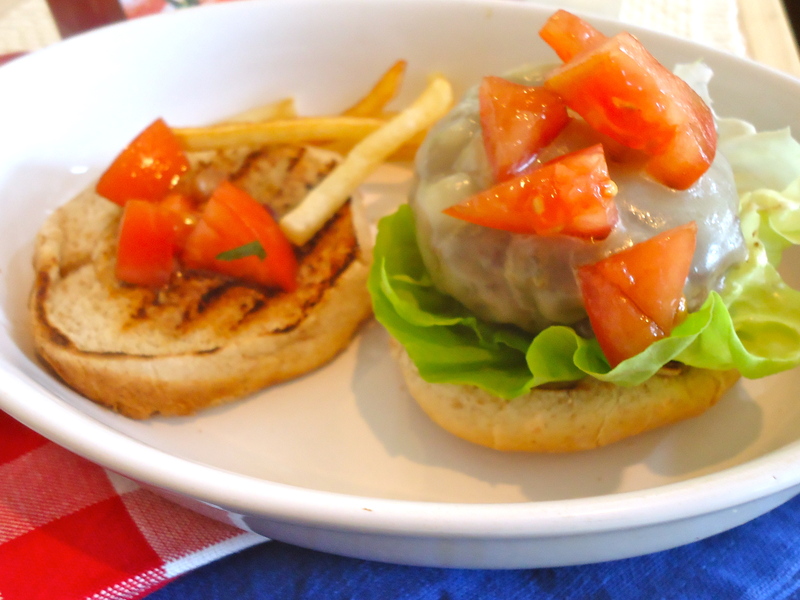 A second extra juicy and extra tasty burger with an Italian touch. The parmesan just adds an extra flavor and fresh tomatoes in tangy bruschetta brings a freshness contrast to the hot grilled meat. Mustard instead of mayo has a strong kick and is way lighter then mayonnaise. As usual do not forget to toast the buns, so warm and cold flavors combine! Start preparing the balsamic bruschetta: in a medium bowl combine chopped tomatoes, olive oil, balsamic vinegar, basil, garlic, red onions and salt mix well, cover with plastic wrap, refrigerate 1 hour for all flavor to combine. remove just few minutes before serving. In large bowl, combine all burgers ingredients together, working with clean hands, divide meat in 4 equal 1/2 inch thick patties, making an indentation nickel size, in the center of each patty. Place patties on grill gridle, coated with olive oil or cooking spray, and grill about 3 minutes on each side or more to your likes. Top quickly each patty with cheese slices cover with foil to let the cheese starts to melt ! While meat is grilling, toast the bun halves in oven or in hot skillet for just 1 minute or 2.